Several online indexes list records for St. Helena Parish. In addition, the Clerk of Courts, located in Greensburg, LA., on 369 Sitman Street, will have further information on the parish vital records. St. Helena Parish, a very small area with only two towns, has had its recent history tarnished by a string of corrupt and law breaking Sheriffs. In the late 1990s, three sheriffs in a row were convicted of various charges of corruption, such as money laundering and using prison inmates for illegal activities. In the following years, St. Helena Parish has tried to distance itself from its tarnished reputation and has fairly well succeeded. 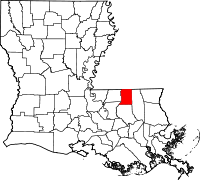 The parish is located on the mid-northern border of the state, bordering the state of Mississippi, and is included in the Baton Rouge Metropolitan Statistical Area. The parish was founded in 1810, shortly after the initial parishes were established.